If you have found yourself frustrated with dating, you may find some answers below. Of course, there are many other issues that can be in the way, but I have seen these three often in my healing work. Below are powerful influences that can affect your ability to find and maintain a healthy, loving and lasting romantic relationship. Not only does it affect relationships in the area of love, but also friendships and family bonds. Pay attention to the sensations in your body to see if any of these resonate with you on some level. Most of us have built a protective armor around our heart to prevent us from pain. The problem is that this wall also prevents love from reaching you. And the amount of love that can flow from your heart out to others is also limited. Most people have many layers of walls around their heart making it very difficult for a loving relationship to occur. Those walls can also be hidden and they occur around the many aspects of the heart. Sometimes a person doesn’t feel safe without a wall, so even if there is an attempt at clearing it, it will come back again. It is important to address not only the symptom which is the wall, but also the cause of this dynamic. Some people consciously or unconsciously believe that there is a specific person for them. They might even use the term soulmate or twin flame. The problem with this belief is that you may be limiting yourself from finding an ideal partner that is not necessarily your soulmate or twin flame but with whom you’d be very happy. I worked with someone who was still very much attached and entangled with a ‘soulmate’ from another life. Because of this strong link she hadn’t been able to find a long-term relationship. There was always something not right with the person. On an energetic level, she wasn’t available to commit to anyone. Even if you want to believe in a soulmate or twin flame, the problem is that they may not be incarnated or available in this lifetime to have this experience with you. Does that mean you shouldn’t enter into any other relationship? I don’t believe so. Many people put too much weight on the idea of a soulmate. Relationships are wonderful and can help you grow immensely when they are healthy and supportive. When you hold many unresolved emotions of abandonment, it can be difficult to create bonds with others. There is a part of you who fear getting left out and let down again. You fear it will only be a matter of time before the person leaves you. Which then creates this situation as you focus and feed this idea. Because of the way the most people are born in the Western World, the feeling of abandonment strongly start right at the time of birth. Working with gemstones can help bring supportive frequencies for healthier relationships. 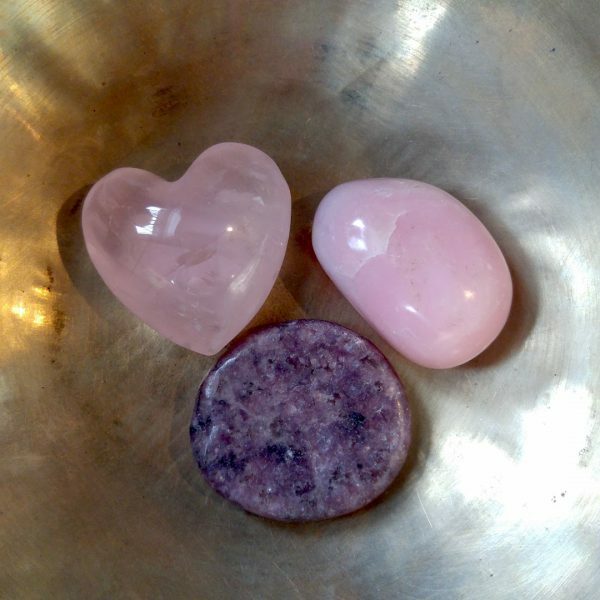 Here are 3 stones I suggest you carry with you to enhance the frequency of love around you. Lepidolite – Lepidolite supports acceptance and self-love, two important components when seeking a healthy and loving relationship. You can only offer and receive what you have within yourself. So the more compassion, acceptance, and love you hold towards yourself, the more you can receive and give to someone. Pink Opal – This stone promotes gentle love and kindness that brings resolution to painful memories. It helps you to open up to the unconditional loving aspect of yourself. It is a soothing and peaceful stone that also support acceptance of self. Rose Quartz – Rose Quartz brings harmony, happiness, love and helps to heal emotions and personal relationships. It helps to open the Heart Chakra to all forms of love. Working on the energies and influences that contribute to an inability to find love and have healthy relationships can quickly shift your current circumstances. If you are interested in working at this deeper level, click here to book personal sessions with me.